WSU’s honey bee research team will advance their study of refrigeration to fight varroa mites that harm honey bees with help from two new grants. First, the WSU team received a combined $200,000 from the Washington State Tree Fruit Research Commission and the Almond Board of California to purchase three 20-foot cargo containers, which will be retrofitted with equipment to control the internal temperatures and atmospheric gasses. Next, the team took those grants and leveraged them to receive a $500,000 USDA Agriculture and Food Research Initiative (AFRI) grant that will start in August, when the refrigerated containers will be up and running. “Our preliminary research has been really promising related to the benefits of using refrigeration storage at different times of the year, so this is an expansion to help save the bees on a large scale,” said Brandon Hopkins, assistant research professor in WSU’s Department of Entomology. The refrigeration technology the researchers are developing centers around fighting varroa destructor mites, one of the leading causes of colony collapse disorder in honey bees. Using carbon dioxide to kill mites in the winter. Doing brood breaks, which stops varroa reproduction and makes them more susceptible to miticides. In the past, the team has used small refrigerators that couldn’t accommodate full colonies. Preliminary studies used micro-colonies. The new containers will allow them to work on a scale that’s closer to real-world, accommodating around 80 full-size colonies each. Every year, beekeepers lose a significant number of colonies, normally more than 30 percent and often over 40 percent of colonies are lost nationally, Hopkins said. If indoor refrigeration can level out those losses, then that provides more flexibility in the honey bee population, so that one crop doesn’t require 98 percent of all U.S. colonies, he said. The over-wintering studies will be divided into three parts over three years, and will use WSU bees along with colonies donated by beekeepers in Washington, Idaho and South Dakota. One third of the bees in this study will be put into refrigerated storage for around two months. Another third will be stored outside in winter conditions. 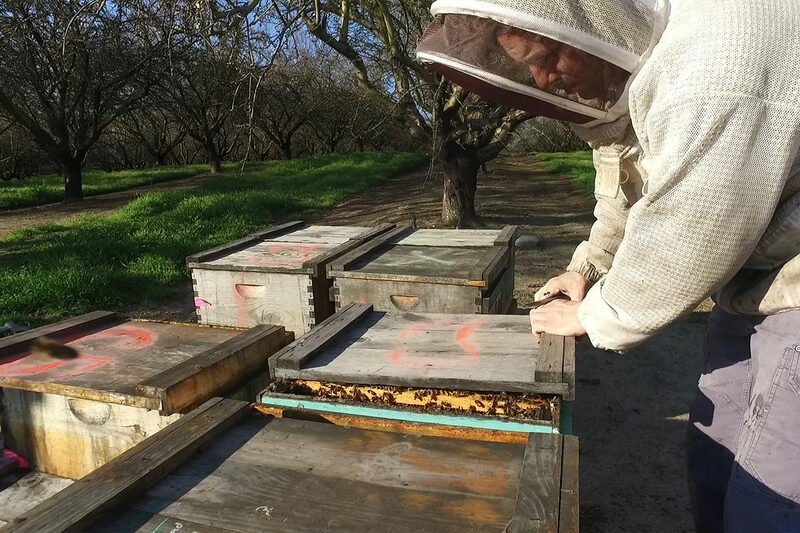 The final third will winter in California, the most common method northern beekeepers use. Hopkins and his colleagues will spend three years refrigerating bees to find out. And the results could have a huge impact on helping save the bees.